The Perfect Honeymoon in Ecuador with True Ecuador Travel. Your Perfect Honeymoon in Ecuador! With so many natural wonders and cultural treasures, Ecuador is the perfect destination for your honeymoon. From romantic haciendas with views of snow-capped volcanoes, to Amazon lodges set beside serpentine jungle rivers, to lazy coastal fishing villages on the Pacific ocean, to the marvels of the unmatched Galapagos Islands, and some of the best colonial architecture in the New World, Ecuador has all the ingredients to create the perfect honeymoon! From one week and upwards we can create the perfect itinerary, with one or a combination of destinations, for your dream homeymoon in Ecuador, whatever your interests and preferences, and taking into account your budget. The Colonial Cities of the Andes! Capital city Quito is a UNESCO-declared World Heritage Site with the best conserved historic center in all of the Americas beside a bustling and thriving new town of professional offices and high rises. Cuenca is a charming, tranquil and historic colonial city in the south of the country, equally well-preserved and welcoming. Other smaller towns such as Riobamba and Otavalo preserve their traditional culture along with their original architecture. All these towns and cities boast first class hotels that are perfect for your honeymoon in Ecuador! The Amazing Amazon Rainforest Lodges! Spend a few nights in a luxury Amazon rain forest or cloud forest lodge, exploring the mega biodiversity during the day and watching the sunset over the canopy of green and the lazy rivers that meander through the forest. Or travel deep into the forest to spend a few days at a lodge run by the original indigenous inhabitants where you can learn about their culture, customs and relationship to their environment. The Luxurious Haciendas of the Andes! Evoking the memories of a bygone era, a stay in a luxury hacienda in the Andes Mountains offers the chance to explore the dramatic landscapes with volcanoes and crater lakes, and the traditional agriculture and indigenous culture of the mountains of Ecuador. Hiking and horseback riding are just two of the activities on offer for the newly-wed couple seeking an unforgettable honeymoon in Ecuador. Along the Pacific coast of Ecuador you will find small fishing villages and towns that still run by the rhythm of the sea. Fine beaches and dry forests, archeological remains of pre-Columbian cultures, whale watching in season, diving and snorkeling, and much more are available to the adventurous couple. The Galapagos Islands are the crown jewel of Ecuador with their stunning and unique biodiversity. 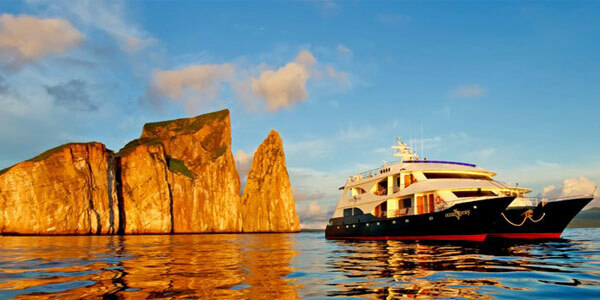 From romantic luxury cruises to top-ranking hotels, the Galapagos Islands have everything for the honeymooning couple to create an unforgettable experience. From 5 days and upwards we can help you design the perfect visit to this once-in-a-lifetime destination for your honeymoon in the Galapagos Islands. An Adventure and Adrenaline Honeymoon! For the action couple, why not put together a honeymoon package filled with adrenaline and adventure! You can trek in the Amazon rainforest, climb, mountain bike and hike in the Andes Mountains, dive and snorkel at the Pacific coast and on the Galapagos, or skydive and paraglide above some of the most impressive landscapes in the world.